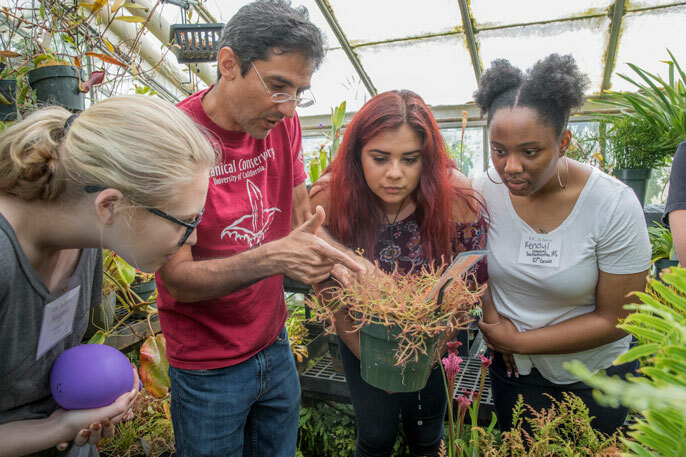 At the UC Davis Botanical Conservatory, curator Ernesto Sandoval explains the behaviors of carnivorous plants to students Margaret Tobin, Vanessa Saldana and Kendyl Lowery. Until recently, Center High School junior Erik Mendez of Antelope, California didn’t plan to go to a four-year college. Now, he has set his sights on UCLA — one of the most competitive universities in the country. Center High School's Erik Mendez tests his solution to an engineering challenge. An unexpected package in the mail changed everything. It informed him that he was among a small group of California students invited to be UC Pre-College Scholars. The mailing included a letter from University of California President Janet Napolitano, congratulating him on his high grades and the academic accomplishments that put him on track for UC admission. It also let him know about financial aid that would cover most of the cost of his education. That aid — offered through UC’s Blue and Gold Opportunity Plan — covers full tuition and fees for students from families with incomes of less than $80,000 a year. “That’s when I realized I could go to a UC,” said Mendez. Since then, he’s pushed himself to keep up his grades, take challenging classes and research the campuses and disciplines that spark his interest. High school students who are part of UC Pre-College Scholars explore the UC Davis campus. Napolitano established the Pre-College Scholars Program in 2016 as part of a broader UC effort to encourage low-income and underrepresented minority students to pursue a UC education. The program is geared, in part, to addressing an issue known as undermatch — a well-documented tendency among high-achieving, low-income students to aim too low when it comes to choosing colleges and pursuing their educational path. Despite strong grades, test scores and academic ability, these students are more likely to steer themselves toward schools with lower graduation rates and less lofty academic reputations. UC’s program has enrolled roughly 3,300 students, who start in 9th or 10th grade and are encouraged to stay with it through the higher grades. The idea: reach students early in their high school careers with information and opportunities that can keep them motivated and on-track for college. Simply being selected for the program lets students know they have what it takes to get to a UC — and that the university wants them, said UC Vice Provost for Diversity and Engagement Yvette Gullatt. “Students may have the impression that kids from their school don’t go to schools like UC. When you look at the numbers, that just isn’t true,” Gullatt said. “Many students are surprised to learn how many kids from their school receive acceptance letters,” said Gullatt. Participants get tutoring, academic support and advice on the process of preparing and applying for college through UC college access programs, such as the Early Academic Outreach Program, which provides services to low-resource California schools. Scholars also get special opportunities to visit UC campuses and get a feel for a UC education. Mendez and other Pre-College Scholars from the Sacramento area visited UC Davis on May 13 for an interactive tour. Students had the opportunity to meet with undergraduate and graduate students and hear about campus life. They ate in the dining hall, toured campus facilities and even had a few minutes to check out the handmade soaps and organic clothing at a weekend music and eco-festival on campus. Rosaamelia Cordova, an 11th grader at Woodland High School, was especially captivated by a grad student doing work in animal genomics. The researcher explained how genetic engineering could be used to breed dairy cows that don’t have horns, so they don’t have to undergo the removal process known as de-budding. One of the most valuable aspects of the program, according to several participants, is the support it offers in helping students understand how to budget and pay for college. UC has partnered with uAspire, an educational nonprofit, to provide students with one-on-one financial advising that can demystify financial aid and help them compare the true out-of-pocket costs for different college options. Many students — including Mendez — are surprised to learn that a UC education is actually among the most affordable options on the market, thanks to the wide availability of financial aid. Almost 60 percent of UC undergraduates have their annual tuition and expenses fully covered through need-based aid. The program has matched pre-college scholars in the Sacramento, Riverside and Los Angeles area with advisors who guide them step-by-step through the financial process. “They told me loans aren’t necessarily bad,” said Cordova. She learned the difference between subsidized government loans, which have lower rates and more flexible repayment terms and nonsubsidized private loans. Following the workshops, Pre-College Scholars stay in touch via text message with their assigned advisor — who checks in periodically to remind them of upcoming filing deadlines, answer questions and offer encouragement and advice. “That’s helped me focus on things I need to do that I would otherwise put in the back of my mind and not think about,” said Cordova. Strolling the leafy courtyards at Davis on Saturday she talked about where she hoped to apply, and her plans to explore other UC campuses, including Berkeley and UCLA. The program, she said, has opened her eyes to all kinds of possibilities. “It’s made me a lot more disciplined and less fearful, where I probably would have been very scared and stressed out, and not had any idea what to do,” she said.